It is June 12, 2018 and that means it is time for another Microsoft Patch Day overview. Microsoft releases security updates for its products on the second Tuesday of every month. 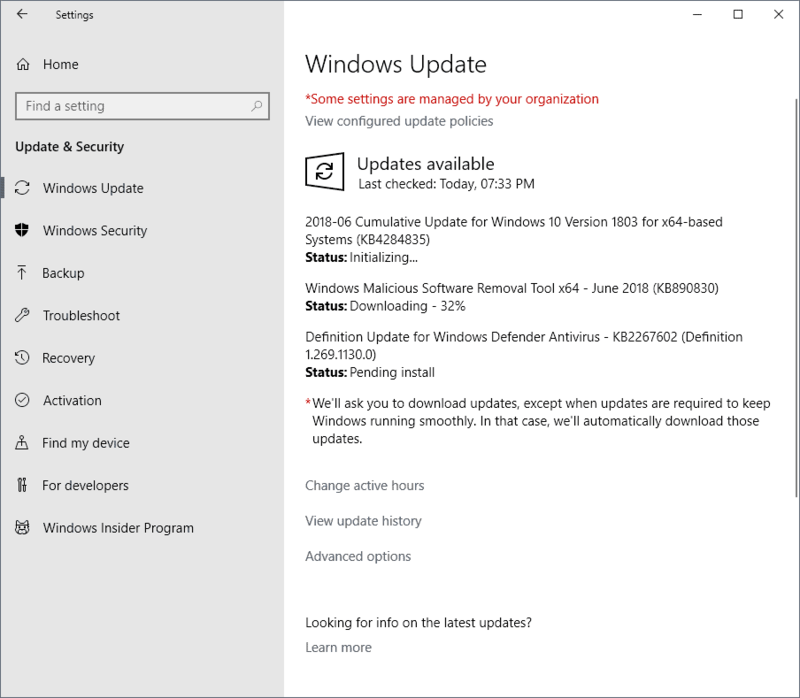 The overview offers information on all security and non-security updates that Microsoft released today as well as details about known issues, published security advisories, and the distribution of updates for all supported client and server operating systems and Microsoft's browsers. The guide includes instructions on finding and download updates, direct download links for those that use them, and resource links pointing to Microsoft's website for further details on individual patches and the release in general. As always, feel free to share your experience in the comment section below. Support for Speculative Store Bypass Disable (SSBD) was added but is not enabled by default. See notes below. Windows 10 version 1607 and Windows Server 2016 systems need KB4132216 prior to installing the June 2016 update. To protect against CVE-2017-5715, Windows Server admins need to consult KB4072698. Client versions are protected automatically. To protect against CV-2017-5754, Windows Server admins need to consult KB4072698. Client versions are protected automatically. To protect against CVE-2018-3639, Windows Server admins and Windows 7, 8.1 and Windows 10 admins need to consult ADV180012. Check out our instructions on adding the protection here. Increased Internet Explorer cookie limit from 50 to ? (Microsoft does not mention the new limit). Improve reliability of Internet Explorer when using geolocation. Blocks firmware updates on devices that have BitLocker enabled but Secure Boot disabled or not present. Increases IE's 50 cookie limit. Permits band-capable disks with one partition and MSR to convert to dynamic disk. Fixed stop error E1 issue when booting with Unified Write Filter and a connected USB hub. IE cookie limit increased from 50. Fixed a mobile-only issue where Enterprise files could be saved as personal files with Windows Information Protection policy enabled. Same firmware issue as described above. Same E1 stop error issue as above. Same IE cookie limit increase. Fixed Edge issue that caused incorrect responses to XML requests. SameSite cookie web standard in IE and Edge. Addressed IE version that prevents the browser from using an updated version of location services. Includes fix for Intuit QuickBooks. Support for SameSite cookie web standard in IE and Edge. Fixed a gaming related issues that would hide certain dialogs if a system was connected to monitors that support interlaced displayed formats. Addressed an issue with brightness controls on laptops. Fixed GameBar failed to launch issue. suspend Bitlocker to install the firmware. install firmware updates before the next OS startup. restart the device so that Bitlocker does not remain in suspended state. Fixed Black Screen issue when booting the opreating system. KB4230450 -- Internet Explorer Cumulative update - The standalone update is not applicable for installation on devices that have the June 2018 updates (or later) installed already. KB4093227 -- Windows Remote Desktop Protocol (RDP) denial of service vulnerability in Windows Server 2008. KB4130956 -- Remote code execution vulnerability in Windows Server 2008. KB4230467 -- Security update for vulnerabilities in Windows Server 2008. KB4234459 --Windows kernel information disclosure vulnerability in Windows Server 2008. KB4284846 -- Security-only update for Windows Server 2012. Stop error on computer systems that don't support SIMD or SSE2. The network interface controller will stop working after you apply the update because of "an issue with Windows and third-party software that is related to a missing file (oem<number>.inf)". Workaround: Start devmgmt.msc and select Action > Scan for Hardware Changes. Alternative workaround: Right-click the device in the Device Manager and select Update. Then "search automatically for updated driver software" or "Browse my computer for driver software". Issues with some non-English platforms where a few strings may be displayed in English instead of the selected interface language. Some users may receive "An invalid argument was supplied" when accessing files from a shared folder using the SMBv1 protocol. Workaround: Enable a different protocol version on client and server. See KB2696547. KB4091666 -- Intel microcode updates for Windows 10 version 1507. KB4091663 -- Intel microcode updates for Windows 10 version 1703. KB4090007 -- Intel microcode updates for Windows 10 version 1709 and Windows Server 2016. KB4100347 -- Intel microcode updates for Windows 10 version 1803 and Windows Server 2016. KB4100403 -- Update for Windows 10 version 1803. KB4100403 cumulative update for Windows 10 version 1803. Fixes various issues. KB4103714 -- Update for Windows 10 version 1709. See KB4103714 cumulative update for Windows 10 version 1709. Fixes various issues. KB4103722 -- Update for Windows 10 version 1703. KB4103720 -- Update for windows 10 version 1607 and Windows Server 2016. See Windows 10 version 1703 and 1607 updates KB4103722 and KB4103720. Fixes lots of issues. Check out the June 2018 non-security updates overview for Office here. What follows is the list of released security updates for Microsoft Office products. KB4022174 -- Fixes a security issue in Excel 2016. KB4022177 -- Fixes a security issue in Outlook 2016. KB4022160 -- Fixes a security issue in Outlook 2016. KB4022191 -- Patches a security issue in Excel 2013. KB4022182 -- Fixes a security issue in Office 2013. KB4018387 -- Fixes a security issue in Office 2013. KB4022169 -- Fixes a security issue in Outlook 2013. KB4022209 -- Fixes a remote code execution vulnerability in Excel 2010. KB4022199 -- Fixes a remote code execution vulnerability in Office 2010. KB3115248 -- Fixes a remote code execution vulnerability in Office 2010. KB3115197 -- Fixes a remote code execution vulnerability in Office 2010. KB4022205 -- Fixes a remote code execution vulnerability in Outlook 2010. KB4011186 -- Fixes a remote code execution vulnerability in Publisher 2010. Note: Please back up your system partition or entire device before you install Windows updates. Things may go wrong and a backup ensures that you can restore the previous version. Windows users and admins have several ways to obtain updates and install these on supported devices. The default option for Home users is to use Windows Update but there are also options to download updates individually from the Microsoft Update Catalog website or through the use of third-party tools like Windows Update MiniTool. Windows Update checks for updates regularly and will download and install them automatically by default on most systems. Click on the "check for updates" button if the update check is not run automatically. Note: If you use Windows 10, checking for updates may find new feature updates for Windows 10. If you don't want those, either configure Windows to postpone feature updates by switching from Semi-Annual Channel (Targeted) to Semi-Annual Channel under Advanced Options in Settings > Update & Security. Updates for all supported versions of Windows may also be downloaded from the Microsoft Update Catalog website. Just click on the direct links below to do so. Microsoft released security and non-security updates for client and server versions of Windows and other products on the June 2018 Patch Day. Good question. I don’t have the answer. I’d probably wait until this gets resolved, but if you are in a hurry, pick the version released today. Make a backup before you do though. Martin, this article says “How to download and install the May 2018 security updates” but just below that speaks to KB4284835 that installed automatically today on my Windows 10 1803 x64 Home laptop.Should it not say June 2018? Typo : Change KB3284878 to Windows 8.l Security-only update. Awesome article, thank you so much for the organized and detailed information ! Do you think it would be ok to go get 1803 or should i stiay with 1709 for now? I would wait a bit longer but if you want to try make a system backup before you do so you can go back. Would it be alright to try 1803 or should i stay with 1709 for now? Personally, I prefer to stay with 1709 until it reaches its end of service (April 9, 2019). Let other early adopters be the beta testers. Any news on when, if ever, M$ is going to fix the broken LAN in 1803? Brightness control is fixed here. Will Media Creation Tool add these latest fixes? Seem to recall I would need to look at the date in properties. Is there any problems faced on windows servers by installing the June month patches? Uninstalled the update and fixed the issue. I´m update cumulative update (june 2018) in Windows 10 1703 and my Excel, Word… it does not work (does not start). Someone report this error?? something solution exist?? THX.